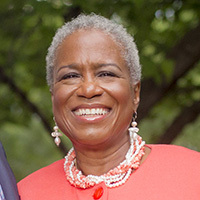 After being treated for cancer at Winship, Monica Pearson served as emcee of the annual Friends of Winship fashion show. For nearly four decades, Monica Kaufman Pearson delivered the news to generations of Atlantans who watched her on WSB-TV. She made her own headlines two years ago when she was diagnosed and treated for liver cancer at Winship Cancer Institute. "I don't know why I got liver cancer, but I was in the right place at the right time with the right physicians to get me healthy again. That's why I come to Emory," says Pearson who also was treated at Winship 20 years ago for breast cancer. Pearson now hosts a weekly TV show for Georgia Public Broadcasting called A Seat at the Table as well as a Sunday afternoon radio program. She also devotes her time to charity work. Last year, she served as emcee of the annual Friends of Winship fashion show. She's grateful for a clean bill of health: "I always say let your attitude be one of gratitude." Monica Pearson with her surgical oncologist David Kooby, MD, who removed a cancerous tumor from her liver in January 2015.